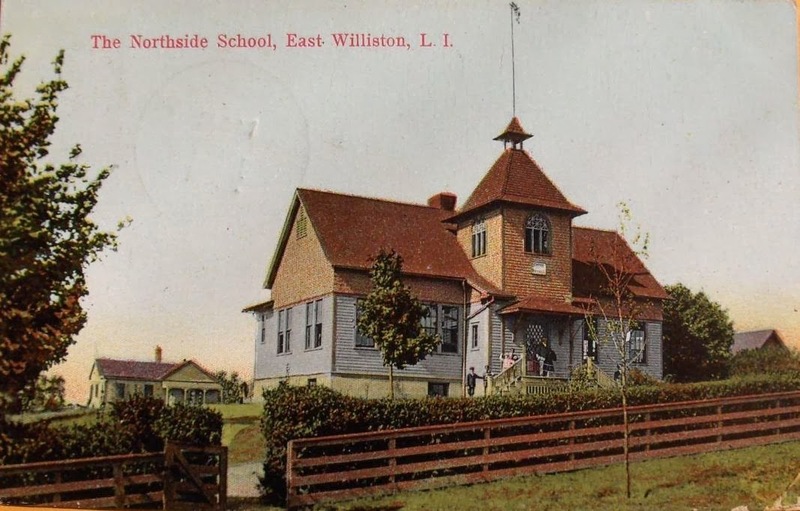 North Side Elementary School in East Williston as it looked when it appeared in the second decade of the 20th century. See the comments for further history. I attended North Side as a kid from 1989-1993. Click HERE to see the school as it looks today. As a side note there once were many more features of historical and architecturally interesting buildings including posts on the villages of Roslyn and Oyster Bay before you concentrated on Gold Coast estates. Any chance of some of that coverage coming back from time to time highlighting significant residential and commercial buildings as well as landmark districts on LI? I’m surprised I’m the first one responding – Anon 9:24AM, it is increasingly challenging for Zach to continue finding fresh photos & information to post. If you want to see more posts on Roslyn & Oyster Bay then go find new information & pictures & send them to Zach. You’ll note he gives people credit for making contributions. But telling him he’s not spoon feeding you what you want to see is disrespectful. BTW – I walk the walk. I’ve sent many photos & articles to Zach; some he has used, some not. No, he’s never given me credit because I told him I don’t want credit. Thank you Zach for posting this lovely photo of North Side School. I also attended North Side with my brother and sister (1955-65). The village historian, Nicholas A. Meyer published EAST WILLISTON HISTORY 1663-1978 (1977) and every household was given a copy. From page 42, Mr. Meyer writes, "The School District was established April 7, 1823.....although apparently no school was erected for seventeen years, until about 1840. The first was a one classroom school on the south side of East Williston Avenue (Hillside Ave.) near Bacon Road. The average attendance was 30.
of the new three room school, and was used as a caretaker's house". Your photo is of this second North Side School and I wonder if the house in the background is that first 1840 school. Also, given the changes in the real estate market since 1977, I wonder if this second school (and first one) is still standing or recognizable. The location should be across Bacon Road from the high school, The Wheatley School. The third, and present North Side school, was built in 1917 with additions in 1929 and 1948. There was a disastrous fire on March 2, 1958 which required extensive rebuilding.